We want you to be totally satisfied with your new Firecat product. You can return any unwanted current item, within 30 days of purchase for a full refund or exchange. The item must be the original condition in which it was supplied. Original packaging and hang tags supplied Firecat must be intact. Allow up to 2 billing cycles for any credit to appear to your credit card statement. For current and regularly priced items, please submit your request for an exchange or refund within 30 days of the date of the original transaction. Clearance/Sale items are non-returnable. For web closeout items, all sales are FINAL. No exchanges or refunds on these items. We suggest that you send the item(s) using a shipping method that will provide you with a tracking number and request a signature upon delivery. Please make sure that the shipping is prepaid and the package is insured for full replacement value. You (the customer) are responsible for return shipping costs. 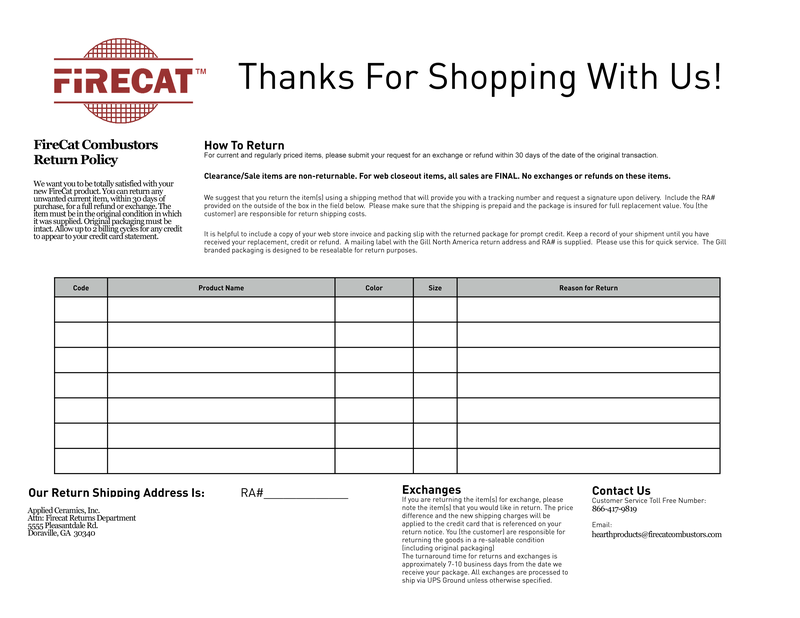 Please print this form to request your exchange or refund. It is helpful to include a copy of your web store invoice and packing slip with the returned package for prompt credit. Keep a record of your shipment until you have received your replacement, credit or refund. If part or all of your shipment was damaged in transit, please call us immediately at 1-866-417-9819. Do not discard the package or packaging materials.